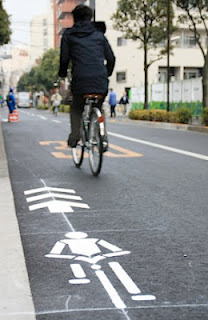 New "Bicycle Navi" road markings remind Japanese cyclists which way to go. This new "Bicycle Navi" mark began popping up in Edogawa-ku, Tokyo on Monday. Not strictly a bicycle lane it is rather a reminder to cyclists to ride with the flow of traffic, not against it. Riding against the flow of traffic will earn you a 50,000 yen fine or 3 months imprisonment. FNN News had a 4 minute long report about the new markings on TV last night. You can view video of that report here. I believe it is a sad state of affairs that you have to remind grown adults to ride with the flow of traffic. Few things annoy me more than having to swerve wide into traffic to avoid a moron coming towards me on the wrong side of the road. Keep left people. 'Bike Snob NY' calls them 'bike salmon': swimming upstream against the flow. Pisses me off to no end too, but it's not like Japanese cyclists or police have any understanding of traffic rules or flow. "Salmoning" absolutely drives me crazy! "HIDARI DE HASHITE KUDASAI!!!" I scream at the geezers/chuugakusei.